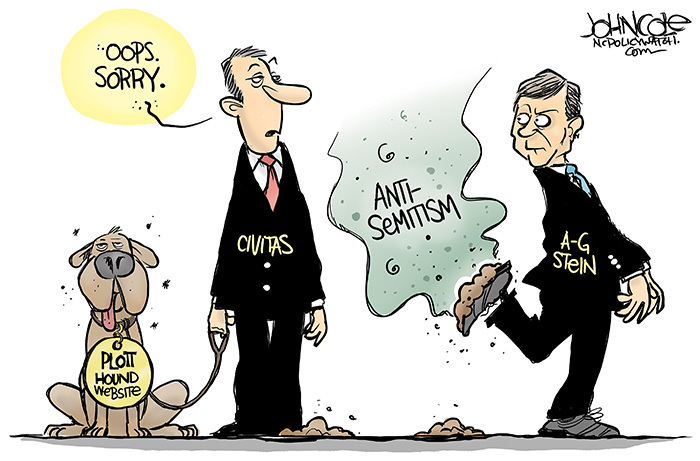 “We regret that an error in judgment was made when Carolina Plott Hound shared a link to a blog post that suggested North Carolina Attorney General Josh Stein made certain decisions based on his ethnicity and religion. To be clear, Civitas condemns the use of identity politics and believes that assigning the motivations of individuals based upon their membership of a group violates a core conservative principle. As such, the sentiments expressed in the blog post do not reflect our values nor the values of our sponsors and supporters. Neither I nor the organization share these sentiments. We condemn all racism, anti-religious speech and ethnic slurs. De Luca also told Raleigh’s News & Observer that Civitas would sell the site. Good for Civitas for finally owning up to this — though it should be noted that the Plott Hound has been engaged in this kind of activity for years. One wishes that Civitas and its funders had not kept the group’s connection to the site hidden from public view and taken such action long ago. #1 – The announcement fails to indicate the name of the individual or individuals responsible for editing the site and, in particular, posting the anti-Semitic link. Does this person (or do these persons) remain on staff? If so, were they disciplined in any way? Ultimately, the central problem here is not the Plott Hound site itself, it’s that a supposedly responsible conservative organization and its employee(s) generated such trash. Simply ditching the vehicle that they used to serve up bigotry appears to leave the underlying problem unaddressed. 2 – The announcement says only that Civitas will no longer operate the site — not that it will be shuttered. And if it’s going to be sold to someone else, does that mean the buyer will keep serving up the bigoted garbage? Who will Civitas sell to — David Duke? The bottom line here: The Civitas action is a welcome start, but the group and its funders need to do more (and show more transparency) to prove that they are acting in good faith and have truly turned over a new leaf. As you alluded to, they should have known better. At any given time over the last few years, a simple sampling of the content shared would have demonstrated that the only discretion Chesser exercised on that site was to highlight the most outrageous articles he could find, regardless of the accuracy or prejudicial nature. And de Luca’s stated aversion to “identity politics,” because he couldn’t bring himself to call it “Anti-Semitism,” is also stumbling under the weight of irony. Nearly everything covered on that site is rooted in identity politics, but poor Francis (bless his heart) is more concerned about deflecting blame than he is evaluating the relevance of his trigger words before he tosses them out.